The intertidal area, that part of the shoreline that is underwater at high tide and exposed when the tide is low, offers a harsh environment for organisms. Salinity, temperature, and moisture vary widely, and wave action can displace or destroy habitat. These conditions vary within the intertidal area and create different zones or vertical banding of habitat and organisms. In this unit, students learn about the variation in environmental conditions and organisms adapted to live within the intertidal zone. This unit focuses on the intertidal zone of rocky shorelines, providing a complement to the focus on sandy beaches in Coastal Unit 1. Student groups develop and perform skits to teach the class about environmental conditions, organisms, and adaptations within an intertidal subzone. Students work in groups to understand environmental conditions within the five subzones represented in intertidal areas, and how Hawaiian marine organisms are adapted to survive in these conditions. 1. How do environmental conditions vary within the intertidal zone, and how does that variation affect the organisms that live in this zone? 2. 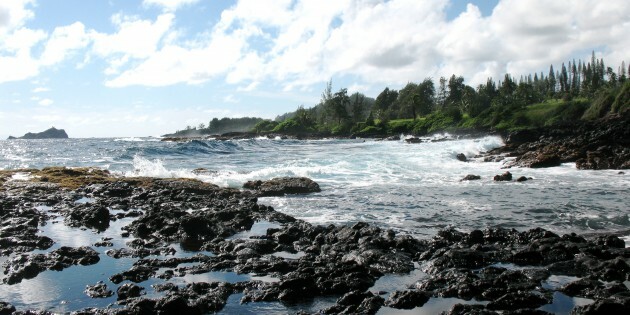 How are Hawaiian marine organisms adapted to conditions within the intertidal zone? Intertidal habitats. Zonation. Marine species. Adaptations. Fielding, Ann, Hawaiian Reefs and Tidepools, Island Explorations, Makawao, Hawai’i, 1998. Hoover, John P., Hawaii’s Fishes: A Guide for Snorkelers, Divers and Aquarists, Mutual Publishing, Honolulu, 1993. Hoover, John P., Hawai’i’s Sea Creatures: A Guide to Hawai’i’s Marine Invertebrates, Honolulu: Mutual Publishing, Honolulu, 1998. The Intertidal Zone video, Bullfrog Films, 1986. 17 minutes. Available for purchase or rental at (800) 543-3764 or for sale here. Merlin, Mark, Hawaiian Coastal Plants: An Illustrated Field Guide, Pacific Guide Books, Honolulu, 1999. Randall, John E., Shore Fishes of Hawaii, Natural World Press, 1996. Abbott, Isabella, and E. H. Williamson, Limu —An Ethnobotanical Study of Some Edible Hawaiian Seaweeds, Pacific Tropical Botanical Garden, Lawai, Hawai’i, 1974. Fortner, Heather J., The Limu Eater, Sea Grant Misc. Report, UNIHI-SEAGRANT-MR-79-01, 1978. Hobson, Edmund S. and E. H. Chave, Hawaiian Reef Animals, University of Hawai’i Press, Honolulu, 1990. Kamakau, S. M., The Works of the People of Old. Bishop Museum Press, Honolulu, 1976. Taylor, Leighton, Sharks of Hawai’i, Their Biology and Cultural Significance, University of Hawai’i Press, Honolulu, 1993. Titcomb, Margaret, Native Use of Fish in Hawaii, University of Hawaiʻi Press, Honolulu, 1972. Titcomb, Margaret, “Native Use of Marine Invertebrates in Old Hawaii,” Pacific Science, Vol. 32, No. 4., 1979, pp. 325-386. Wyban, Carol Araki, Tide and Current: Fishponds of Hawaiʻi, University of Hawaiʻi Press, Honolulu, 1992.